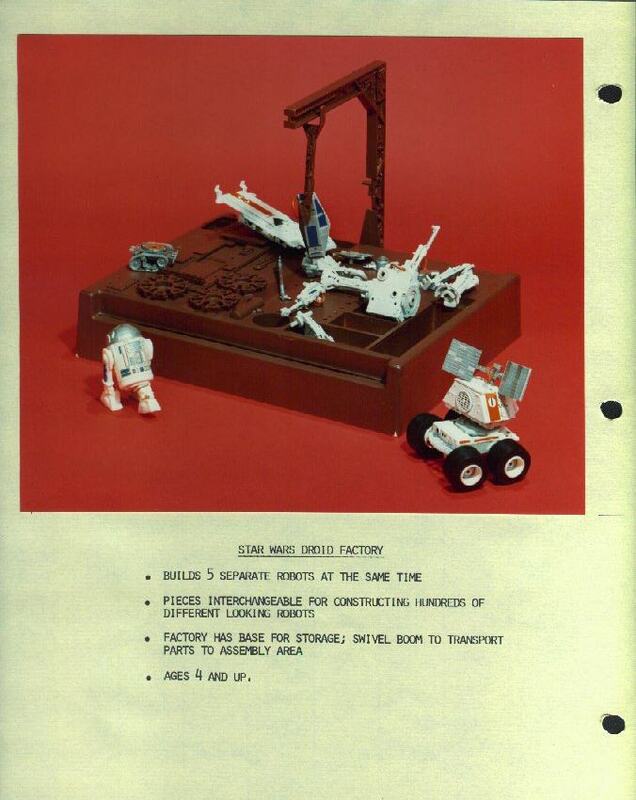 This exact photo was used on the second series (21 Back) Star Wars figure cardback and in the 1979 Kenner in-pack catalog. It differs greatly from the released toy and is quite a treat to see up close like this. The basic idea of the set was the same, but nearly everything shown in this photo was altered for production though some of the droid parts do resemble their production counterparts. This prototype base appears to have been made of white styrene and painted brown. It looks like the designers intended the parts to be grouped in several pockets rather than having a form-fitting spot for each piece. There is a crank on the support arm of the crane, but it's unclear if it was actually functional. Perhaps they intended this to control the back and forth motion of the hook.